Before using these templates, please review the Pierce College Communications Standards and Guidelines. All documents are in Microsoft Word document template format. Contact us if you need another version. 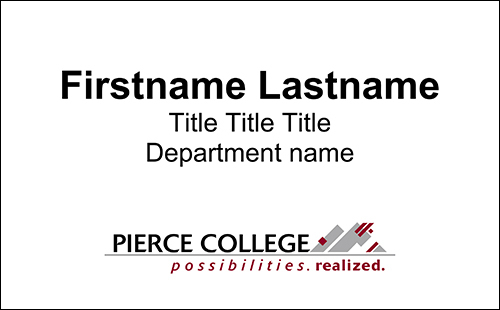 Download the Microsoft Word template for office nameplates. We have a collection of photos on OneDrive available to Pierce College employees for use in college publications. Use the model release form to get permission from people when you take their pictures for use in college publications. 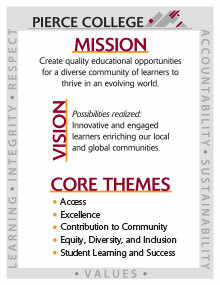 Print your own 8.5x11 file of the Mission, Vision, Core Themes and Values poster. Download poster. Large color 11x17 prints are available at the print shops at each campus. Pick one up today! Download a fax cover sheet.